Note: I’ll have a spoiler section at the end if you want to keep reading! Previously on Gotham, Barbara was held captive by the Ogre (and he killed her parents at her under-duress request), Jim shot the Ogre, Edward had to get rid of a pesky body (and pretends that the boyfriend left town), Bruce met Lucius Fox (who is definitely on his side) and confessed the murder of Reggie to Alfred, and Cobblepot started a war between Falcone and Maroni (that little weasel). Everyone at GCPD is on duty until further notice. When we open, Fish is back on the mainland, and she greets Selina. Bruce is looking for his father’s secrets, and Alfred insists that there’s nothing there. Barbara is, thankfully, all patched up despite a slash to the throat. Lee insists that Barbara undergo trauma counseling, which Barbara will only do if Lee will be her counselor. That’s weird, eh? Oswald goes to visit Falcone in a creepy hospital room with a bodyguard (because he’s a coward at heart), confesses that he started the mob fights, and almost stabs him with a scalpel but Jim catches him in the act and places them under arrest. Jim wants Falcone to get everything back in order, but the current commissioner is corrupt as HECK and is just going to kill Falcone right then and there. Ugh. Luckily, Jim prevents this too, and he, Harvey, Oswald, and the bodyguard make a narrow escape. 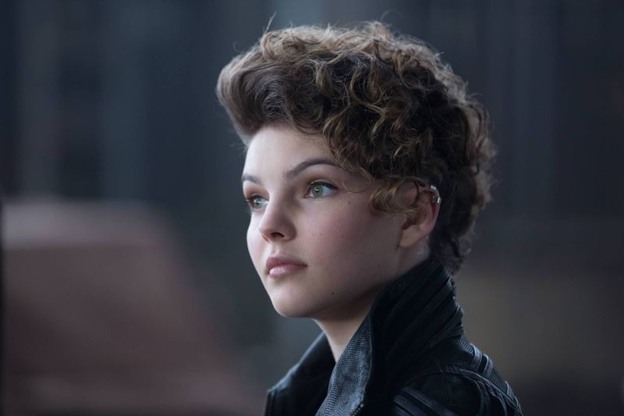 The gang rolls up to a secret warehouse, and Falcone’s all like, “everyone who knew about this is dead!” And then, with perfect timing, Fish comes in with an Important Haircut and Selina, also with an Important Haircut. She takes our heroes hostage. If Fish gives Falcone’s head to Maroni, she gets her position back. Or something. She’s also pissed off about the bad stuff that happened to Butch off screen. Anyway, she’s gonna kill everyone except for Harvey, because they’re cool. I hope their relationship gets explored more at some point! That’s one of my biggest questions from the season. Maroni is an absolute jerkass to Fish, and she is NOT happy with him at all, but he’s absolutely dense and can’t see her utter rage. After he continually taunts her, belittles her, and calls her Babes after she asks him not to, she SNAPS and shoots him in the head. In the ensuing chaos, our heroes escape. As a friend on Twitter said, “the fact that so many women are quoting Fish and knowing that feeling of uncomfortable pet names really says something.” I found this to be a really powerful moment for both Fish and the audience. Falcone confesses to Jim that he’s out of the business because he’s had time to reflect, which is actually kinda bad news for the city because it leaves a power vacuum. He’s going to retire down south (Florida, I assume). Fish’s group and Jim’s group meet up AGAIN, and now Oswald has a minigun and is on a SPREE for Fish. Barbara and Lee’s ongoing conversation is really weird and Barbara seems to have an angle…THEN we learn that BARBARA was the one who killed her parents, NOT the Ogre! AHHH. She chases Lee with a knife. They have an absolutely BRUTAL fight, and Lee wins, knocking Barbara out. It’s a really intense fight. Meanwhile on the roof of a building, Fish and Oswald have their own knock-down fight. Butch interrupts the pair of them, his gun wavering between the two because of his brainwashing. He ends up shooting them both and is very upset about it, but Fish forgives him. Unfortunately, Penguin tosses her over the roof and screams “I’M THE KING OF GOTHAM!” and it’s terrible. Elsewhere, Kristin confronts Edward, because she notices the code he left in the note. She leaves, very suspicious, and when alone, he begins arguing with himself. It’s a genuinely unsettling scene. Falcone gives Jim a gift that Jim’s father gave to him. Bruce finds his father’s secret – it’s a BATCAVE. Is it next season yet? !